Like all Mallaghan ® products, ease of use and robustness are the main feature of this type of vehicle. The stair offers high drive stability, a generous platform for safe working conditions with various additional options. If you would like more information on any equipment offered by Mallaghan ® then please get in touch with a member of our sales team : sales@mallaghanGSE.com. 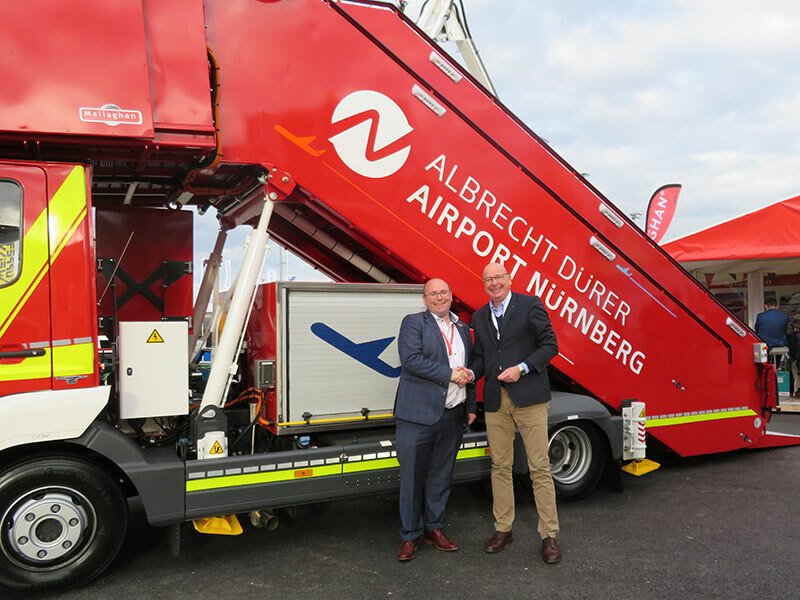 Pictured on stand with the NEWLY launched ‘Mallaghan ® Fire Rescue Stair’ at recent Munich – Inter Airport Show: Mr. Jan C. Bruns (COO. Chief Executive AirPart GmbH & Manager of Business Unit Aviation) alongside Mr. Ronan Mallaghan (Mallaghan ® – Director).